It is impossible for any Government to expect obedience to their Law without informing the people in legible form, the commission said. The commission observed that it is impossible for any Government to expect obedience to their Law without informing the people in legible form. The commission found it surprising that the Ministry has not used the Information technology to provide access to text of law. The commission also noted that the Law and enactments are in public domain and none can claim copyright in the law and Section 4 mandates the Ministry of Law to place the texts of enactments. It is the duty of Legislative Department to provide information about access of every updated enactment and it is not just a recommended obligation under Section 4 (1) (a) of RTI Act, but a constitutional mandate, a legal necessity, and an essential requirement for peace, the commission said. The Commission appreciated the complainant for raising an issue which is significant not only for law students like him but also for common citizens. The commission added that it is the minimum responsibility of state to provide updated information about amendments, which will go in long way in helping people. The access to law is not just a requirement of Law student and law researchers, but a necessity of all citizens, the commission held. The commission also observed that if laws are not available in easy accessible format, it will result in two major problems, (1) People will be kept in dark about their Laws, (2) Private Publishers will exploit this in-access to Law to make money by publishing updating Acts as their copyrighted work. The Commission directed the Legislative Department to inform the complainant and the Commission as to what action has been taken including details of the programme of updation, the possible date of its completion, expenditure involved, personnel employed etc. The Commission also recommended the department to recognise urgency and significance of the issue, expedite the process, allocate more fund to employ more personnel and complete the process of updation as soon as possible. It also also directed the authority to examine the functionality of the email ID in view of the Complainant’s claim that most of the email ID have failed. The Legislative Department also should have perfect RTI filing system and answer mechanism. 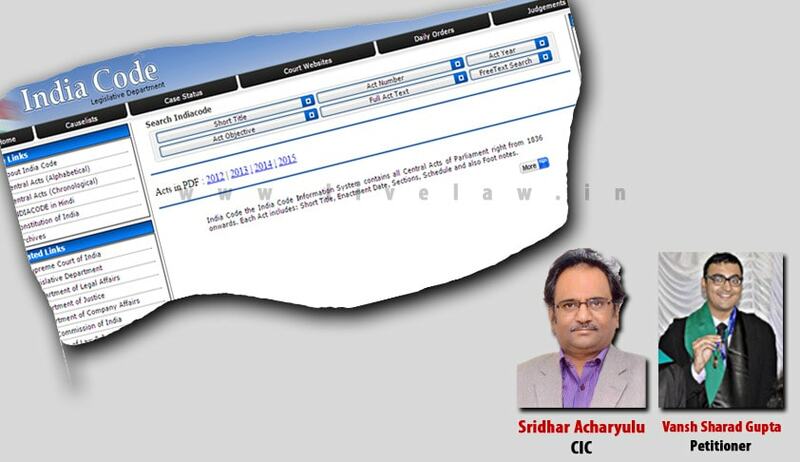 The authority was also called upon to pay Rs.10,000/-) as a token compensation to the library of the National Law School of India University, Bangaluru, for causing loss of time of several law students, more specifically of the appellant, not providing easy access to email, or not making email ids easily available, delaying the information etc, within one month. The Commission asked the respondent authority to explain the measures that they have taken in this regard, within one month.